My friend Lauren invited me to dinner at Cafe Flourish; it's closer to her apartment and her friend Lauren (yes, "the Laurens") was in town and looking for great vegan eats. While my normal vegan go-to is Real Food Daily, I decided to stop in and visit with them and check out Cafe Flourish again. You can check out my first post about Flourish here. In that first post, I wrote that I was unhappy with the dessert I bought. I remember wanting to like it but not enjoying it. With Babycakes now serving up life-changing cookiewiches here in Los Angeles I don't know if I'll ever venture anywhere else for cookiewich, or anything similar. 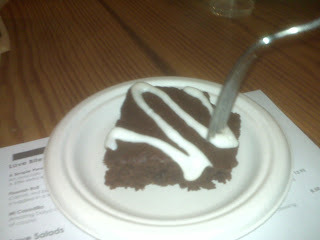 However, Cafe Flourish has a new gluten free dessert -- a brownie. The icing looked awesome so I ordered one up for the girls and I to split. We were all very surprised by how much we enjoyed it, particularly because I was unhappy with the whoopie pie from Flourish. The brownie was moist and chewy and the icing was spectacular, especially for being vegan and gluten free. I'll definitely check out Flourish again for their great, gluten free mac and cheese and these delicious brownies. The restaurant's prices are also more reasonable than Real Food Daily's. Ooo that looks great! I'll have to go there and try the mac and cheese too. Thanks! !